While I was cleaning out the photos I had on my phone, I realised that there were quite a few of coffees and edibles from various places I frequent. Instead of deleting them all, I thought I'd write posts about some of my favourite places to share. Some of the pictures were taken just because so they may not be the best quality but I'm sure the deliciousness will show through! As a mother, there are few things I appreciate better than a really great coffee. Well... maybe a really great coffee home delivered to my hand while steaming, perhaps with a side of warm scone with jam... I digress. If I can't have my coffee delivered, the next best thing is having a great cafe close by. Enter Hallowed Grounds Espresso. Located at Shop 2, 1417 Logan Rd, Mount Gravatt, there is plenty of street parking around. Seating is either on the footpath or in the cosy interior on an eclectic mix of tables, benches and chairs. You order at the counter inside, which is beside a display cabinet full of cakes and sandwiches. If you're eating in, you get a painted spoon to take back to your table. Coffee is freshly roasted Elixir coffee, which has not yet failed to disappoint. If the cakes and sandwiches on display in the cabinet aren't to your taste, there is an all day breakfast and lunch menu options as well. Many of the items are vegetarian and can also be easily adapted to be vegan friendly as well. Staff are friendly and chatty, and happy to make suggestions if you need help. They have managed to crate a little community driven cafe - regulars are recognised and greeted with glee. Dogs are welcomed outside, and treated with fresh water and doggy treats. The cafe is chock full of interesting posters, collectables and even things for the kids to play with (thank you!!). 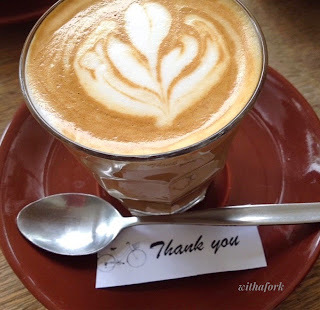 It's the little things (like thank you notes with your coffee) that make a cafe worth going back to again and again. Hallowed Grounds Espresso have that. Do you have a favourite local cafe? The staff is friendly, quick, and efficient. I love that all the seating is outdoors, which guarantees that they are packed even in warm, sunny weather when no one is really craving hot coffee. Der optimal ekaffee coffee is strong and cheap, and they promote fair-trade https://issuu.com/latte10/docs/espresso_2.docx/1?e=26607705/30000297!! !